Cosmetic physician Vivian Chin, MD, MPH has loved skin care and aesthetics ever since she was a little girl. Dr. Chin has degrees from Vassar College, Columbia University Mailman School of Public Health, and New York University School of Medicine. She also completed postgraduate work in health sciences and practical dermatology from the University of Auckland and the University of Cardiff respectively. 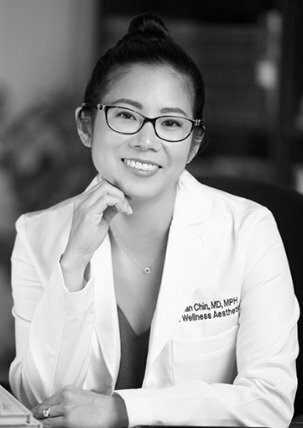 Dr. Chin has devoted herself to the health and well-being of everyone under her care. Supplementing the medical aspects of skin care, Dr. Chin also trained as an aesthetician at Dermalogica Academy in Manhattan, which has further enhanced her understanding and application of ingredients in personalized skin care regimens. Growing up on the Upper East Side of New York City, the daughter to a dermatologist, she was surrounded by – and fascinated with – skin creams and potions. When she noticed that the skin care products her dad contributed to a Brearley Middle School fundraiser improved the self-esteem of the recipients, she became a firm and fervent believer in healthy skin’s ability to transform lives for the better. She started her own skin care routine while in middle school and has been perfecting it ever since. Dr. Chin has always been interested in holistic medicine with a focus on integrating wellness into daily life. She believes health is more than your medical chart and that well-being is essential to maintaining a youthful heart and aura. Dedicated to her craft, she frequently attends aesthetic and dermatology symposia, always intent on finding the latest, science-based technologies to bring to her patients. Professionally, she is a member of the American Medical Association, American Society of Cosmetic Physicians, American Academy of Aesthetic Medicine, American Society for Laser Medicine and Surgery, and American Medical Spa Association. As an entrepreneur, she is a member of the National Association of Women Business Owners NYC Chapter (NAWBO), United Women in Business NYC Chapter, and the Manhattan Chamber of Commerce. In addition to all things cosmetic and wellness, she loves photography, travel, and combining photography with travel.